Adding a sliding glass door to a home or business adds beauty and light, and as an architectural element, a slider can also provide a focal feature that can enhance your property’s style and design. But while sliding doors can make a beautiful and functional design statement, they can also pose unique security risks that are different from the risks associated with traditional wood or steel doors. Many homeowners and businesses are aware of the risks associated with sliders, and as a result, they may shy away from adding them to their property. But the fact is, there are plenty of relatively simple steps you can take to ensure your sliding glass door unit is extra secure and provides plenty of deterrence to would-be burglars. The first step is determining the “weak points” of your sliding glass door system. When it comes to sliding glass doors, there are three primary ways a burglar can get in: Breaking or forcing the lock, lifting the door out of its track (“jimmying”) or smashing the glass. Very few burglars use the last approach since the noise is generally deafening – certainly enough to cause the homeowner or neighbor to phone the police. Most sliding doors have a single, thin locking mechanism located about midway down the frame. These locks are typically some of the easiest to force open since they lack the reinforcement and bulk of traditional door locks. Many locks can be cut with hacksaw or pried apart with a screwdriver or other tool, and some can simply be “jiggled” loose by repetitive motion. Other burglars prefer to pry or “jimmy” doors out of their frames using a pry bar. Obviously, the best way to prevent break-ins is by addressing all these potential security issues using modern technology developed specifically to reinforce sliding glass doors and to thwart intruders. First, one of the most important things to know about sliding doors is that the locks they come with – the ones installed right in the door itself – aren’t always of the highest quality. The best way to determine if an existing lock provides the security you want and need is to consult with a locksmith. A locksmith can inspect the lock and determine if it’s sufficient or if it may need additional reinforcement or, in some cases, replacement. When replacement isn’t possible or isn’t desired, you can still add additional security by having a secondary lock installed. Most auxiliary sliding glass door locks are installed on the back edge of the slider or along the top rail along the frame or track. Many building codes require sliding glass door locks to be operable from the inside without keys, so be sure you know what your municipality requires before having a lock installed. In doors with vinyl frames, you should also ensure the fastener and the bolt mechanism pass through the wood or metal framing portions of the door to provide adequate security. Many property owners decide to replace the door’s original locks in addition to adding an auxiliary sliding glass door lock for maximum protection. Because of the unique way sliding doors function, the best way to make sure the lock works as it’s intended is to have it professionally installed. It’s also a good idea to consult with an experienced locksmith about the best type of locks for your specific style of sliding glass doors. and accessing the locking mechanism or opening the door completely to gain entry. Even an inch or two of allowance can enable the door to be pried up from its frame, so make sure the safety bar you select is designed to fit the frame snugly. Most safety bars operate from latching mechanisms that are easy to operate from the inside. Some bars may use keys to lock them in place. As with locks, be sure to determine if your building code allows safety bars with locks before installing them. Most safety bars have a mounting plate that enables the bar to be easily stored out of the way when not in use. When selecting a bar, be sure to choose one that’s light enough to be easy to operate, but not so light that it can be bent by someone applying force form the outside. Mounted properly, safety bars can prevent both horizontal and rotating motion of the door panel. Also, be sure to mount them so they can be seen by potential intruders. 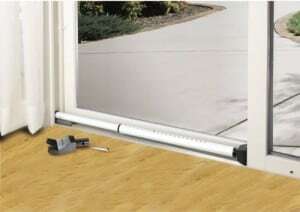 A jimmy plate is a long, flat plate that’s installed above the door frame on the sliding part of the door. Once installed properly, the plate prevents the door from being lifted and rotated out of position. Jimmy plates are installed directly in the door track, so they need to be carefully installed to ensure the door remains operational. Most property owners install jimmy plates in addition to auxiliary locks or safety bars – or both – to ensure maximum security. Consider adding a special film to the door glass to make it more difficult to break, or replace glass with a durable material that resists breaking. As with any entry or window, be sure to keep shrubs trimmed so they don’t obscure a view of the door from the outside. Installing motion lights is a good idea, especially for back doors or doors in more secluded areas. And of course, adding an alarm designed specifically for a sliding door can add that extra peace of mind you need to feel your property is well secured. Adding sliding glass doors can add beauty and functionality to your home or business, and adding sliding glass door locks means you can enjoy your doors with peace of mind. To ensure your door is as secure as possible, give us a call at (610) 644-5334 or send an email to [email protected]. We’ll be happy to help you learn about all your security options.